Let's face it, I should probably just re-name this blog "mea culpa." It simply happens far too often that I drop the ball. I promise you posts and recipes, and then life intervenes, sometimes in startling and good ways, sometimes in horrifying ones. I know this happens to everyone. Quite a number of my most favorite bloggers take a little hiatus here and there. But I do feel neglectful; I promised you the story of my lovely Lisette baking afternoon with friends Peter and Karen, which happened fully three weeks ago. As far as excuses go, I did have a family crisis, which has fortunately been resolved. 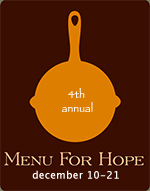 Then of course there was Menu For Hope (thank you all so much for supporting this great cause), which took up my blogging time and energy for the past couple of weeks. Sadly, my pictures from Lisette-baking Sunday did not appear. It's not just that they didn't turn out; they somehow or other vanished from my camera altogether. But you've had a fair number of Lisette pictures, and you know what these dome-shaped, glazed little lebkuchen nut tortes look like, even if you can't lick the screen and find out what they taste like. I have to see the vanishing of the pictures as something of an omen. I'm simply not meant to share too much information about these cakes. Suffice it to say that I had a lovely time with Peter, being his sous-chef for the Lisette-making process, and learning not to sprinkle too many nonpareils on top -- as well as sharing tales of childhood. Peter told me several delightful stories about his family's erstwhile Lisette-making business -- how his father, an engineer, created a machine that could automatically grind large amounts of nuts by jerry-rigging their little old-fashioned nut-grinder; how his mother was invited to sell her luscious little cakes at some of Manhattan's poshest department stores. It was indeed a glorious afternoon, and at the end, I went home with a large container of beautiful glazed Lisettes. That batch is, unfortunately, long gone; I've bought the ingredients for more, but haven't yet had the time to put them together. In the meantime, I've been cobbling together time for my annual cookie-baking ritual. I had thought, of course, that this year I'd get lots and lots of baking done, as I'm on sabbatical. Somehow or other, just the opposite happened. Here it is Christmas Eve, and instead of a dozen kinds of goodies for the cookie platter, I have a mere eight. But they are eight very good ones. I've also made some modifications to old favorite recipes that have worked out very well, and I'll share those with you anon. So far, I've managed a large batch of the good old-fashioned oatmeal cookies with-everything-in-them. In addition, I've made wallflower loaves, extreme gingers, double-chocolate mint cookies, linzer biscotti, espresso-toffee shortbread, World Peace Cookies , and oh, I don't even know what else. And I've made the cookies I'm about to share with you. You see, I'm thinking you might need another cookie at the eleventh hour, or perhaps you have plans for baking during holiday week or for New Years'. So I'm going to give you one of the all-time, most-requested favorites of my repertoire, Pecan Sand Tarts. Oh, you say. Yet another recipe for the Mexican Wedding Cookie/Russian Tea Cake clone. ZZZZZ. But I'm going to have to exhort you to give this version a try, because there are several things that set it off from the standard recipe for this treat. One is the ratio of pecans to flour/butter/sugar/etc. This recipe has about twice the number of pecans as the standard formula, and the added crunch factor is quite noticeable. And that brings me to the second point. 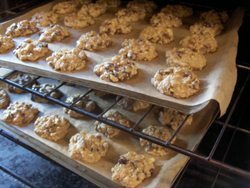 Instead of grinding the nuts to a powder, this recipe leave them chopped so that some of them are finely ground and some are quite chunky, which gives great texture to the cookie. Next is the fact that cake flour is used, which makes the whole thing quite light, and increases the whole melt-in-your-mouth factor. Then there's the low amount of sugar in the dough, which means that you don't go on sugar overload when you coat them with powdered sugar. Instead, there's a nice contrast of the only faintly sweet and nutty buttery cookie to the sugary coating. And finally, there's the baking time. 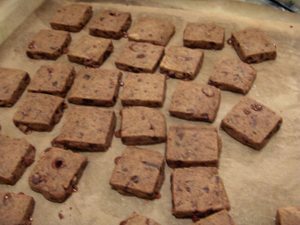 These cookies are baked slowly, for a long time at a lower temperature than normal. This gives everything a chance to develop fantastic flavor instead of leaving a generic nutty buttery pastiness in your mouth. You can pre-toast the pecans if you wish, but I think the slow baking gives them the extra toasted crunch anyway. I've been making these cookies since I was about 10 years old, ever since the Christmas a neighboring family gave them to us as part of a cookie assortment and I begged the recipe from them. They called them pecan puffs, but my father said they tasted like cookies he remembered from long ago, and he always called them sand tarts. They're his favorite, and beloved of many other family members and friends as well. So instead of apologizing any more for my bad blogger tendencies, I leave you with this, another recipe which has become a family heirloom for us, and will perhaps become one for you as well. Approximate yield: 30 - 50 cookies, depending on how large you roll them. I usually make this recipe times six during this season -- the demand for them is such that a large number of people would be unhappy with me if I showed up without them at holiday time. Preheat oven to 300 degrees F (150 degrees C). Line cookie sheets with parchment. In a medium bowl or a stand mixer, cream together butter, sugar and salt until smooth. Beat in the vanilla. 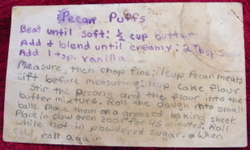 Roughly chop pecans in a food processor or blender so that you have a mix of textures; toss with cake flour. Stir the pecan mixture into the creamed mixture until well blended (at this point, the dough can be refrigerated and kept for several days, to bake at a later point. Or it can be frozen, probably for a couple of months). Roll the dough into balls "the size of a walnut," then place them 1 inch apart onto the prepared cookie sheets. Bake for 30 to 40 minutes in the preheated oven, or until nicely golden brown (keep an eye on them; ovens differ, so I'd begin checking at 20 minutes). 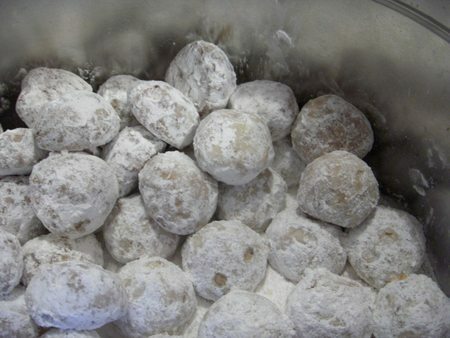 Roll warm cookies in confectioners' sugar (I often skip this step, not liking too much sugar -- I just roll them when they're cool). When cool, roll again. The tease is at least partially over, and here, as promised, is the recipe for a cake so delectable, I don't know why we're not all making it all the time. It's a very perfect, slightly intense holiday dessert, meant to be enjoyed in thin slices. It's excellent served either at a reasonable interval after a festive meal, or perhaps during an afternoon visit with friends, over tea. It would also be great with champagne, or perhaps mulled wine. I believe that even those who don't particularly like walnuts would enjoy this torte. 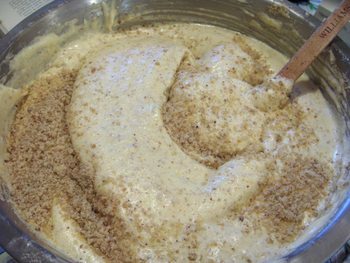 Somehow the bitterness that some people find problematic in walnuts is transformed into pure sweet spongy nuttiness with this recipe. Balanced with the bittersweet lushness of plenty of dark chocolate in the filling and icing, it's simply a delight. It is not a difficult cake to make, really, especially if you have a food processor and a stand mixer (and I used to make it even in the bad old days when I only had a hand-held mixer). It is, however, a finicky recipe, and a bit time-consuming. It warrants some degree of care, so it's best to make it when you can move through the steps in a relaxed way. Rushing through something like this is, in my experience, a recipe for nothing more than disaster. I've meant to blog about this recipe for years, but I don't make it very often, since it is rich, dense, serves a large number of people and is really a special occasion dessert. Finally the perfect moment to make it arose -- and therein lies a tale. More than two decades ago, my mother's closest friend gave her a cookbook which had just been published, called Nela's Cookbook (upon recent examination, I discovered that this delightfully readable book was edited by none other than, of course, Judith Jones). 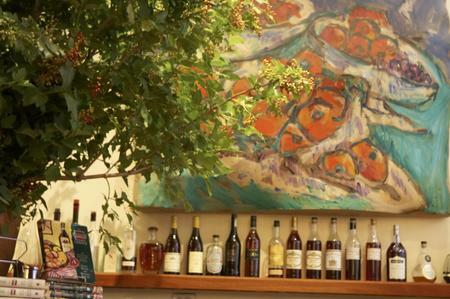 It was a tome of the recipes and anecdotes of Nela Rubinstein, wife of the famed pianist Artur Rubinstein. Nela was a celebrated hostess and cook among "their set", who included fellow musicians, various politicians, intelligentsia and nobility as well. Nela (who died in 2002, just three days before my own mom) was Polish, and many of her recipes reflect this heritage. Until I read this cookbook, I was not aware of the delicacy and refinement of many aspects of this cuisine, which also contains a balance of robust, somewhat heavier dishes. In this way, as well as in other particulars of specific recipes, it's extremely similar to the Russian cuisine beloved of my mother, and, by extension, our whole family -- a sort of cooking that encompasses both highly refined, Francophilic food and hearty, peasant-based soups, stews and dark breads. My mother's favorite recipe out of this book was the Torte Orzechowy, a rich, chocolate-iced walnut torte, which, while she was up to it, she made every year for my birthday. She was thrilled to have come upon this cake that I adored and craved, especially since I had long become the family baker. 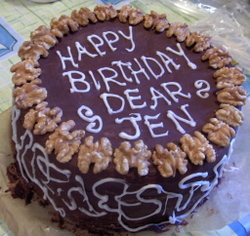 My mother had felt for a while that it wasn't quite right that I should have to make do with a bakery cake when I was the one that always came up with extravagant confections for everyone else's birthday. She made this for me for many years, as long as she still could. My father would help her beat the egg whites, since they were still using an old rotary eggbeater and it took the kind of muscular strength that wasn't easy for elder people. About a year and a half ago, the lovely Bakerina stayed up all night at my house in her quest to complete Blogathon 2006. Before G and I crashed that night, I was doing my best to keep her entertained and give her blogging material. I gave her homemade peach sorbet and showed her Nela's Cookbook, and, like any right-minded baker, she was immediately taken with the recipe for Torte Orzechowy. "I want to blog about this," she said. "Ummmm," I said. "What is it?" she said immediately. "Ummm, well, I've always sort of meant to blog about this cake. I kind of have a history with it, you see. My mom used to make it for my birthday." "Ah, then I'll wait for you to blog about it. Besides," said she, "There's another cake in here that I'm equally taken with, and I'll blog about that." She was talking about the Sand Torte, which she of course not only blogged about, but also eventually made very successfully (this being a cake that I had a spectacularly gummy, unrisen, dead-weight failure with about a decade ago, and have never attempted since). And of course I was being utterly small-minded and silly about this, since really, the world-wide interweb's most enjoyed and utilized recipes are those that many of us have blogged. In any case, when Bunni approached me about a surprise birthday party for Bakerina, I offered to bake the birthday cake -- and knew that there was only one cake that would do. It rose and baked beautifully, and was eaten with delight by all the guests -- at least those who didn't have nut allergies (sorry, didn't know). My one criticism of this particular effort on my part is that I was trying to gild pure gold, and used Nela's variation of raspberry jam as a filling, which she suggests using instead of chocolate filling for one layer. I put it in along with the chocolate filling, going for overkill. It was only after I tasted it that I remembered that I hadn't really loved this variation as much when my mother used it one year, preferring just the flavors of nuts, rum and chocolate, although I often love jam in things like this. Most importantly, Bakerina was duly pleased and surprised by her soirée; our hostess Bunni made a copious, multi-coursed, elegant and delicious meal, and plenty of wine and conversation were enjoyed by all. Since my mother's death, I've only made this cake a few other times -- notably for Passover seders where I was a guest, and wanted to bring something wonderful. 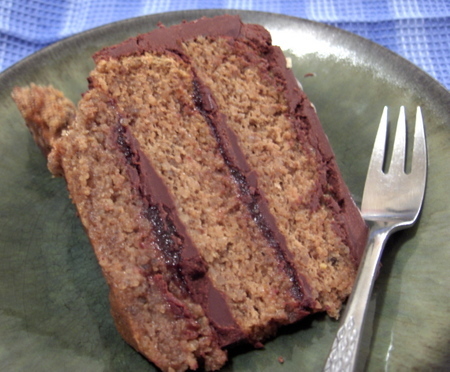 It makes an excellent Passover cake with the substitution of matzoh meal for the bread crumbs. But Passover is far away. My current holiday hunch is that, since it is a rather spongy, springy, egg-based cake it would behave like a roulade batter and make an excellent Bûche de Noël. I think the nut-rich batter could be baked in a parchment-lined, buttered-and-floured 10"x15" jelly-roll pan, and rolled while still warm to keep the cake layer malleable, then unrolled, filled, re-rolled and iced -- just as you would any other jelly-roll sort of cake. The baking time would need to be monitored carefully. I'd probably start with about fifteen minutes baking time, since the sheet layer may be rather thin, and begin testing for doneness from there. The filling and icing that go with it would work for this purpose too -- the texture of the icing would be perfect for striating into trompe l'oeil bark. I'm aching to try this, and may just do it for a holiday party. I'm typing this pretty much as it is written in Nela's Cookbook, but interjecting a few modifications into the text -- some of these were made because I, in my haphazard fashion, thought I had everything I needed, but had to make a couple of quick substitutions. The modifications in methodology (adding the sugar in three stages, mainly) I made because I think they give a better result, with more volume to the finished batter and thus more lightness to the cake. I've put my own mods in italics, so you can distinguish them easily from the original recipe. Nela says: "This rich, dark, nut layer cake is perfect for large parties, since one serves it in small pieces. As a rule I cut a circular core, about 1 1/2 inches from the edge, then cut the circular rim in truncated wedges and the core in pointed wedges. For this cake, I use the processor to grind the nuts and the big mixer (fitted with the whip) for the eggs. This is one of my mother's best recipes, one we have always made for special events such as birthdays and Christmas." Butter and flour 3 9-inch layer pans or one 10-inch springform (I also used parchment circles, buttered and floured, on the bottom of each tin. It's worth noting that this cake bakes very differently in different pans; I didn't have 3 9" layer pans of the same sort, so I used two heavy, dark pans, and one old light-colored, lightweight aluminum pan -- in which the cake took MUCH longer to bake, fell a bit, and was not as stable). If you grind the walnuts in the processor, grind them with 1/2 cup of the sugar to prevent oiliness (I zested the orange/clementine in long strips, ground it in the processor with the 1/2 cup sugar and proceeded to use this orange sugar to grind the walnuts). Preheat the oven to 350 F. Beat the egg yolks and sugar together until they become very pale and form the ribbon (I used only 1/2 cup of sugar here, and reserved the last half cup for beating with the egg whites, in order to stabilize them). Add the cream (I forgot, but no matter). Mix together the grated nuts, orange zest, bread crumbs, and salt. Beat the egg whites till stiff (I beat them about halfway, then added the salt here, rather than with the bread crumbs, and began to sprinkle in the last 1/2 cup of sugar while I was still beating them, until they became thick and stiff and shiny, but still pliable, like Italian meringue) and fold them into the yolk mixture (I do this very slowly and carefully, trying to ensure that I don't break down the aeration in either mixture any more than necessary). Sprinkle the nut mixture over the batter, gently folding it in until evenly combined. Distribute the batter equally among the 3 layer pans or spoon it into the springform. Bake the layers for 25 - 30 minutes. Halfway through baking, exchange the layers from the upper to the lower racks, from the front to the back of your oven, so that all will bake evenly. The springform version takes 50 minutes to bake. Let the cake cool for 5 minutes in the layer pans, then unmold the layers onto racks. In the springform pan, cool the cake for 20 minutes, then unlatch and remove the wall of the pan. To cut a large cake into layers, cut it vertically in half, then cut each half into 3 equal layers. When you reassemble the circles, the frosting will hide the cuts (I've never actually tried this). Before filling and frosting the cake, sprinkle the layers with rum. They should then sit for 30 minutes (to absorb the rum) before you assemble the cake. Spread the lower layer of cake with half the Chocolate-butter Filling (following recipe), put another layer of cake on that, and spread with the rest of the filling. Top with the third layer, then frost the assembled cake with the Chocolate Mazurka Icing on page 337 (recipe follows). Decorate, if you like, with halved walnuts. Melt the chocolate over very low heat, and allow to cool. Cream the butter and combine it with the chocolate (which should be cool enough to touch comfortably) and the rum and the salt. Nela says to use a chocolate like Tobler "Tradition". It's worth noting that this recipe was written before we had so many different chocolates with differing cocoa contents available to the home cook. For this glaze, I use either a 60% or a 70% chocolate, depending on my audience and their tolerance for bitter chocolate, or I use a combination, which also works well. This makes a shining glaze 1/4 inch thick (on cooling, the glaze is quite a bit duller, especially after it's been spread -- but still delicious).